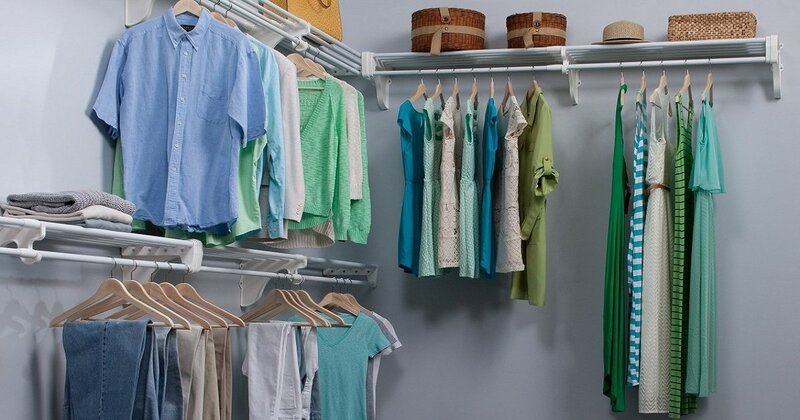 What Is the Best Way to Organize Clothes in Your Closet? When you have a lot of clothes in your closet, the biggest challenge is organizing the clothing in the closet. There are a number of ways you can organize your clothes. Truth be told, there are pros and cons to each approach. There is no ultimate right way to do it. The best way to organize clothes in your closet is to follow your lifestyle, habits, and preferences. What works for me, doesn’t necessarily works for you. With that in mind, let’s talk about some of the approaches, and you can then choose your best way to organize clothes in your closet. Some women, and men, like to organize their closet by outfit. This makes it easier to choose something to wear in the morning, as all of your outfits are ready to go. Just grab an outfit and you are all set. However, the downside is that this approach is a bit limiting. Because your closet is organized by outfits, it is hard to mix and match what you already own. One set white shirt goes with one set black skirt, and that is that. You cannot experiment, which means you cannot discover new ways to make your wardrobe work. But if you are a busy person, and you do not have a lot of time to think what to wear in the morning, organizing your closet by outfits is the way to go. Or, you can take an alternative approach. Allocate a section of your closet and some hooks for set outfits for the week, and then organize your other clothes by another approach. This is one of the preferred approaches for organizing your closet. Not only you keep things organized, but you can also identify where you have most items. For example, if you already own 10 black skirts, there is no need to buy a new one. You can easily identify items in the most color, the least color, and where you have too much duplication. Until you have everything grouped up together, you won’t notice the duplication you might have. The downside of this approach is that sometimes, organizing your clothes by color in your closet is not enough. It works only when it is categorized not only by color, but by classification as well. This is organizing your clothes by type. Or, in other words, all pants go together, all shirts go together, all skirts go together, and so on. It is likely the best way to organize clothes in your closet, and one of the most popular ways to organize clothing in a closet. As mentioned previously, you can take it to the next level by combining color and classification. Organizing your closet this way will help you see everything in a neatly and organized fashion. You can identify where you have too much, or not enough of a particular color, print, or pattern. The only downside is that your clothing is not as readily as with outfits. Those that live in areas where the weather changes dramatically by season, might not want to use this approach. However, if the weather fluctuates in your city, it might be helpful to try the weather approach. That means your long sleeve shirts and jumpsuits go in a completely different area from little black dress. The best thing about this approach is that you can finally see what you wear often, and what stays forgotten in the closet. You will be surprised by the results. Some of us tend to wear certain combinations over and over again. And instead of having to search for the pieces individually, you can hang them up next to each other. That way, you can have your favorite outfit ready to go on any given time. One way to discover which are your favorite outfits is the hook system. What does that mean? Well, when you wear an item, put the hook forward. And all other items put the hook backward.